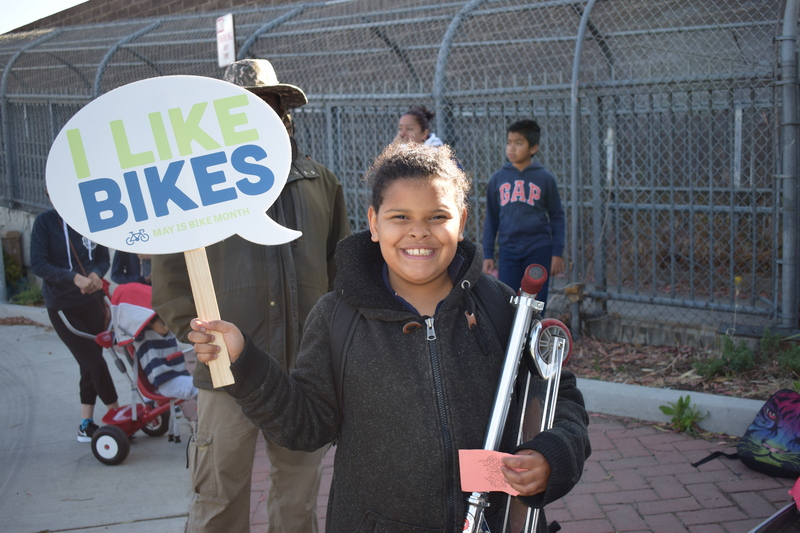 Pacific Elementary Bike to School day 2018 (WALKsacramento). As women’s history month comes to a close, WALKSacramento has been reflecting about the trailblazing women who have been fierce advocates for mobility options and the challenges that women, especially women of color, still face in their daily lives when it comes to transportation choice. The following articles examine challenges and opportunities for women who use transportation, who plan for transportation and for the advocates who bring mobility options to women and other marginalized groups. Join us in celebrating and learning more about creating gender inclusive transportation. This article calls for more gender inclusive cycling infrastructure to help combat climate change. The article outlines data the illustrates the majority of cyclists in urban hubs such as San Francisco, London and Barcelona are male. This is an important disparity to address because transportation is such a large portion of greenhouse gas emissions. In order to encourage clean transportation cities must plan for all genders to feel safe and secure riding or walking around. The article talks about prioritizing women’s safety in public space because women learn early on how to factor their personal safety into their everyday trips. The article ends with a final call to plan for more inclusive cycling infrastructure because the status quo can change if we acknowledge the gendered transportation experience. Read the article here. A new study published by the Mineta Transportation Institute at San Jose State University found that only 15 percent of the transportation work force is women. This includes planners, operators and leaderships roles. This article connects this statistic with a question, does having this few of women in the transportation workforce correlate to a service that does not serve all riders? The article suggests that that answer is yes because this results in high level transportation iniatives and funding that may go towards infrastructure that half the population may not feel comfortable using. The article also explores the importance of having culturally relevant transportation service. The end of the article outlines some recommendations for improving diversity in the workforce such as connecting with women early in their school years and working on the perception of the industry. This is an important study; it is crucial that people providing a vital public service such as transportation understand the needs of the people who will use it. Read the full article here. This article profiles the organization, Friends on Bikes that works on creating an inclusive cycling atmosphere. The group organizes bike rides specifically for women of color, trans individuals and other members of marginalized communities. The founders saw a lack of diversity and representation in cycling groups and worked to tackle that problem. The founders talk about the importance of having diverse communities involved in cycling so that more people can find people they are comfortable riding with. The article highlights how you can be an ally for women of color and LGBTQ cyclists by be open to listening and actively making an effort through time money and resources to show up for these communities. Cycling should be a place all members of a community feel excited to explore, read more about this organization’s work here. This report poses insightful solutions to create climate action that addresses gender gaps in transportation, policy and other aspects of planning for the future. The report establishes that gender influences daily life in a city and the vulnerability to climate change. The gender gap in climate change preparedness needs to be addressed to successfully meet the Paris Agreement reductions. The report talks about the importance of creating the capacity for more women in leadership roles by investing in mentorship programs. Another important solution is analyzing gender differentiation through disaggregated gender data, gender responsive policies and women safety audits. Women can help propel the global conversation of climate change and should be lifted up and supported through key investments and a dedication to creating a future for all. Read the full report here.